It's rare that the person who deserves to win actually does -- and makes Bravo history, to boot. 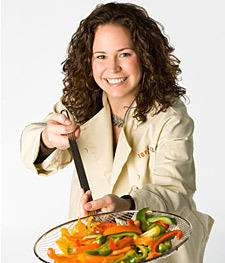 From the first episode of this season's "Top Chef," Stephanie Izard was my favorite. She was so humble, genuinely nice in that Midwestern way. A Chicagoan through and through, Stephanie seemed like the kind of girl who would knock back a beer or six and pick up the tab to boot. None of that sneering, chest-puffing bravado that seizes so many other cheftestants (as my colleague Heather Havrilesky so accurately refers to the "Top Chef" cooks in her hilarious finale wrap) when a camera is trained upon them. Stephanie was easygoing, generous to her competition; she was also there to win. And damn if she didn't, becoming the first woman to grab the title of … Top! Chef! This is a significant victory, in no small part because professional kitchens have so long been dominated by men. Yes, there are fantastic female chefs -- New York's Patricia Yeo and New Orleans' Susan Spicer come to mind -- but, as I recently wrote in an interview with "Top Chef" host Tom Colicchio, the chef world has mostly been a boys club, and no woman had ever nabbed the title on the Bravo show. Stephanie has already worked as an executive chef (at the now-closed Scylla), but the series win, and the 100 grand, obviously jack up her profile. And frankly, it couldn't have happened to a nicer gal. As she tells the AV Onion Club in an interview today, "I have a secret mission to be an Olympic champion, and I guess this is as close as I'm going to get."